Seminal Contributions of Historical Iranian (Persian) Philosophers, Poets, Physicians and Scientists, Revisited. By Davood N. Rahni, New York, U.S.A. I am writing in response to a recent article, "Rediscovering Arabic Science" by Richard Covington in the Aramco World Magazine, the official public relations piece published by a tax exempt organization in Houston Texas and sponsored by Saudi Arabia. The article, as do an intensifying large emerging number of articles in the west during the past decade, depicts the scientists in the Middle East, Central Asia and North Africa in the past 2000 years as Arabic.� Although this is a dramatic improvement over the twentieth century during which the citation of the work of such scientists in the west remained non-existent or convoluted, at best, Covington opts for a selective citation of Persian scientists, and as the title of his work shows, Rediscovering Arabic Science, it implies that they are Arabs; this is far from the truth. Whereas an inclusive nationalism advocacy by any nation, including the newly established Saudi Arabia is reasonable, such strong advocacy of nationalism by a lucratively commissioned author should not include fabrication of a national historical identity for a young nation that emerged out of the oil exploration of the 20th century, by taking pieces of history from other historical nations and ethnicities such as the non-Arab Iran and the Persians, the Egyptians, the Turks, the Syrians, the Indians and the Central Asians, and collectively insinuating them to be "Arabic." Ever since receiving the latest hard copy issue (May/June 2007) of the World Aramco Magazine ���(also available at http://www.saudiaramcoworld.com/issue/200703/) , I have appreciatively read the article Rediscovering Arabic Science, three times, and cannot help but to applaud the author in his efforts to highlight some of the finest scholarly works of the distant past in the region. I would, however, take strong issue with the misguided selection of the article's title and the implication throughout that these past scholars were solely Arabs. The article is well researched, and comprehensively written. It broadly covers the multi-faceted scientific and technological contributions of learned people from China to Spain made toward the betterment of life for humanity through almost 1000 years when Islam was the catalyst for governance and spirituality in this vast region of the world. The article further spells out eloquently and illustratively the substantive impact such "Islamic" science has had on western civilization, and modern science and technology post-Renaissance. My humble suggestion is for Covington and others like him to consider submitting the same kind of articles to the mainstream western media with the right title and due recognition to ethnicities, especially at this taxing politically charged juncture with the proper title. The aspirations of the 1.3 plus billion ethnically diverse people in the "Muslim" world for homegrown democracy and socio-cultural and religious reformation are seriously undermined by hegemonic influences and pre-emptive military interventions. The predicament of tens of millions of otherwise law abiding and immensely contributing citizens in the West with ancestry from the south and southwest Asia or referred to with the fabricated and historically baseless "Middle East" is particularly precarious. I read with enthusiasm your recent article, "The Image of Alchemy". 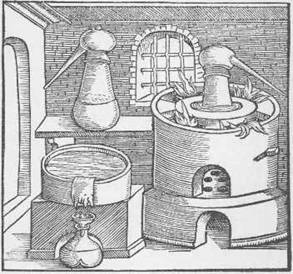 The article does an excellent job illustrating the seminal contributions of alchemists in post-Renaissance Europe. 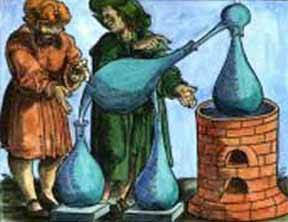 The word alchemy, as the definite feminine article al- demonstrates, had its origin in Aramaic, Arabic and Hebrew odysseys in the area now called Middle East.� We must not forget the [multifaceted] contributions of the people of that region in the millennia before the treasure troves, that they had safeguarded and expanded, were passed on to Europeans. It is worth citing, for instance, such Persian scholars as Avicenna, Biruni, Farabi, Omar Khayam, Rhazes, Algorithm, and Jabin ibn Hayyan. The avid reader may only review a brief introduction to Iranian/Persian scientists in this prose. It is hoped that similar information can also be found on Indian, Syrian, Egyptian or Chinese scientists elsewhere; and that the same coverage can be extended to scientists of Buddhist, Christian, Hindu, Jewish, and Zoroastrian faiths of the distant past and before the advent of, or after Islam. �Then, western scholars would be obligated to adhere to a minimum set of internationally accepted standards for generating manuscripts with complete citations. They should for instance, focus solely on the Saudi Arabian scholars or Kuwaiti scholars and present them, based on verifiable referenced facts and merits. A humble, meritoriously constructive feedback on the recently cited article titled: Rediscovering Arabic Science as it appeared in the propaganda Saudi magazine World Aramco immediately implies an Arab centered theme and thereby undermines the powerful message the article presents thereafter. It connotes, as if science did not exist in India or China, and in the Greek and the Persian (Iran) worlds before the "Arab" influence, and if and when science happened it was all "Arabic". An author of modest historical knowledge of the region knows better that this is farthest from the truth. If one in our own communities cannot recognize the specific contributions of our ancestors in their own right and nationalities, no wonder then, as to why the West, only in the 20th century along with the oil, reluctantly discovered the historical importance of the peoples of the regions. It is indeed true that after the advent of Islam in the 7th century, Arabic, (as now English) became the standard language of scholarly endeavors, thanks to the Persian Ebne-SibaWay, whose tomb is in Shiraz, who developed a grammar and syntax for Arabic! Nonetheless, as pointed out in the body of Covington's article, there is only the slightest likelihood that many of the scientists of the circa 10th through the 15th century were "Arab", although they may have, in part, used, Arabic, the language of governance that led to its use in the science of that era to record and disseminate their discoveries. In fact, based on Covington's article and consistent with the well-documented citations he and others have used, the unanimous majority of these scientists in the said Islamic era were NOT Arabic; this is particularly true of "Saudi-"Arabian Peninsula south of the Persian Gulf. We can hardly count on more than the one hand the scientists from Yemen, Oman, or the sparsely populated tribal regions that with the discovery of oil in the 20th century gave birth to Saudi Arabia, UAE, and Kuwait. The few "Arab" scientists were from today's Iraq, Syria and Lebanon then ruled over by the Omayed, Abbasid and later the Ottoman caliphs. While the majority of such "Islamic" scientists were Persian/Iranian and came from Central Asia all the way to today's Iran, they mostly wrote their books in Arabic, the highly syntaxed and orderly structured medium for communication under the Islamic rulers. It is true that Islam originated in Mecca and Medina; nonetheless, one can not deny the many original influences of Christianity, Judaism, Zoroastrianism, Mithraism and the Epic of Gilgamesh in its evolution. Going back to Covington's otherwise excellently written article, there are many instances, where the novice reader is at a loss to truly identity the name or the city of birth of scientists with Jewish, Persian, Indian heritgae, and not carelessly conclude that most, if not all, were of "Arab" pedigree from the central Arabian peninsula! Simply put, if today's scientists of the region,� dwindling in number as they are from the Arab world, and Iran and India write their scientific contributions in English, this, should in no way, be misconstrued, now or a 1000 years from now, that they have sworn allegiance to the Americans or the British. Again, as pointed out in the Aramco World article, Baghdad, Shiraz, Isfahan, Constantinople, Damascus, Jondi-shahpour, Bukhara, Samarghand, Rey, etc. became centers of the learned communities, while Mecca and Medina and Jerusalem remained traditional places of worship and trade! In retrospect, many of us would have felt less perturbed, if the title of Covington's article was Rediscovering the "Islamic Era", rather than "Arabic Era" science. One understands the desperate need of the newly established Saudi Arabians with their abundant influx of oil revenues and the bitter reality of the Saudi origins of most terrorists as on September 11, to aspire to fabricate a noble "Arab" identify; however, this should not be so self-centered as to selectively [mis-] appropriate from other heritages and implicitly call it their own. It is painfully ironic for "older" nations in the region to witness the erosion of their stature as they are overlooked by internal and external establishments. Let us remember that even Egypt and the rest of the North Africa were NOT Arabs, but with the advent of Islam became Arabized. In summary, let us reiterate humanity's full confidence in the ultimate triumph of all peoples of the region in making the world a better place for all with mutual respect. The duly recognized Arab historical heritage should synergistically co-exist with Turkish, Persian/Iranian, Israeli, Indian and Greek historical heritages without one seeking exclusive self-glorifications. Solidarity for justice, leading to peace and tranquility for all humanity, should be the driving impetus. The distinguished list of historical Persian (Iranian) artists, poets, physicians, philosophers, architects, artisans, scientists and technologists, is rather long and encompasses many hundreds throughout the past two millennia. Suffice it to cite here a few of them alphabetized who are renowned in the west, despite being labeled erroneously as Islamic or [Arab] by certain records and as explained earlier. Each name is hypertext tagged with its comprehensive sources on the Internet, mostly from Wikipedia. Abhari� (1200-1265). He was prolific on logic, natural philosophy, and metaphysics. He also made notable contributions to theoretical geometry. His works were translated into Hebrew and Latin and his influence is evident in Western treatises of late medieval and Renaissance times. 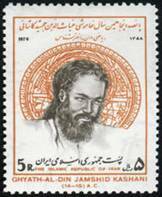 Aka as Kharazmi, born in Khorasan Iran, was a Persian scientist, mathematician, astronomer/astrologer, and author. He is often cited as "the father of algebra", which was named after a part of the title of his book, Hisab al-jabr w'al-muqabala, along with the algorism number system. Kharazmi (Algorithm) made major contributions to the fields of algebra, trigonometry, astronomy/astrology, geography and cartography. 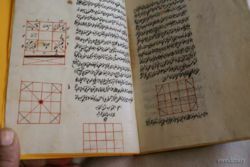 His systematic and logical approach to solving linear and quadratic equations gave shape to the discipline of algebra, a word that is derived from the name of his 830 book on the subject, al-Kitab al-mukhtasar fi hisab al-jabr wa'l-muqabala or: "The Compendious Book on Calculation by Completion and Balancing". The book was first translated into Latin in the 12th century, from which the title and term Algebra derives. contributions were based on the original research of the Hindus in Astronomy and Greek, and other sources. He appropriated the place-marker symbol of zero, which originated in India. When his work became known in Europe through Latin translations, it made a significant contribution to the advancement of mathematics in Europe. He also wrote on mechanical devices like the clock, astrolabe, and sundial. His other contributions include tables of trigonometric functions, refinements in the geometric representation of conic sections, and aspects of the calculus of two errors. Alhazen (965-1040). He was born in Basra, then part of Buwayhid Persia (Iran). He was summoned to Egypt by the mercurial caliph Hakim to regulate the flooding of the Nile. During this time he wrote scores of important mathematical treatises. 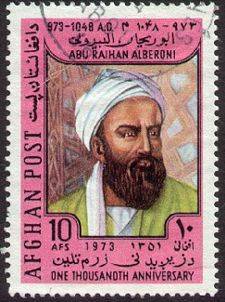 Alhazen was a pioneer in optics, engineering and astronomy. According to Giambattista della Porta, he first explained the apparent increase in the size of the moon and sun near the horizon, although Roger Bacon gives the credit of this discovery to Ptolemy. He taught that vision does not result from the emission of rays from the eye, and wrote on the refraction of light, especially on atmospheric refraction. 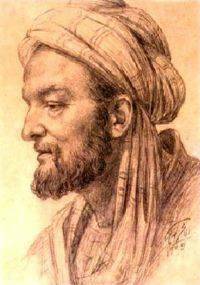 Avicenna (in Persian, Abu Ali SINA �(980 - 1037) was a Persian physician, philosopher, and scientist. He was the author of 450 books on a wide range of subjects. Many of these concentrated on philosophy and medicine. He is considered by many to be "the father of modern medicine". 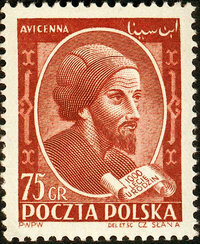 George Sarton called Ibn Sina "the most famous scientist of all races, places, and times." 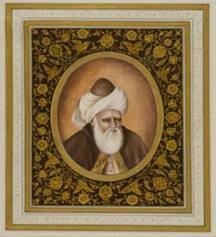 His most famous works are The Book of Healing and The Canon of Medicine, also known as the Qanun. 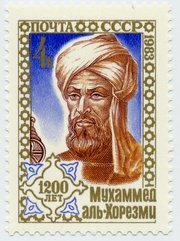 Biruni (Biruni, Alberuni) ; (973 -1048) was a Persian mathematician, astronomer, physicist, scholar, encyclopedist, philosopher, astrologer, traveller, historian, pharmacist and teacher, of Central Asian origin then part of the Persian Empire, who contributed greatly to the fields of mathematics, philosophy, medicine and science. He wrote his books mainly in Persian (his native tongue) and Arabic (the language of science and commerce then) but also in Hebrew, Greek, Sanskrit and Western Aramaic. 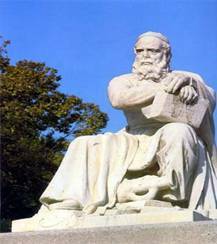 Farabi also known in the West as Alpharabus, Alfarabi, (870-950 CE) was a Persian philosopher and scientist and one of the greatest scientists and philosophers of his time. 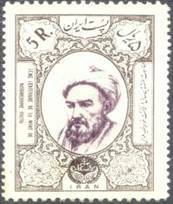 Farabi made notable contributions to the fields of mathematics, philosophy, medicine and even music. As a philosopher and Neo-Platonist he wrote rich commentary on Aristotle's work. He is also credited for categorizing logic into two separate groups, the first one being idea and the second being proof. Farabi wrote books on sociology and a notable book on music titled Kitab al-Musiqa (The Book of Music). He played and invented a varied number of musical instruments and his pure Arabian tone system is still used in Arab music (Touma 1996, p.170). Farabi is also famous for his demonstration of the existence of void in physics. Ferdowsi (935-1020) is a highly revered Persian poet. He was the "Homer" author of the Shāhnāma, the national epic of Persia (Iran). Ferdowsi was born in the Iranian province of Khorasan, in a village near Tus (Baj). His father was a wealthy land owner. His great epic, the Shāhnāma ("The Epic of Kings"), to which he devoted more than 35 years, was originally composed for presentation to the Samanid princes of Khorasan, who were the chief instigators of the revival of Iranian cultural traditions after the Arab conquest of the seventh century. After 30 years of hard work, he finished the book and two or three years after that, Ferdowsi went to Ghazni, the Ghaznavid capital, to present it to the King. There are various stories in medieval texts describing the lack of interest shown by the new king, Sultan Mahmud of Ghaznavi, in Ferdowsi and his lifework. According to historians, Mahmud had promised Ferdowsi a dinar for every distich written in the Shahnameh (60,000 dinars), but later retracted and presented him with dirhams (20,000 dirhams), which were at that time much less valuable than dinars (every 100 dirhams worth 1 dinar). 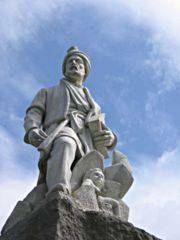 Ferdowsi rejected the money and, by some accounts, he gave it to a poor man who sold wine. Wandering for a time in Sistan and Mazandaran, he eventually returned to Tus, heartbroken and enraged. His masterpiece, the Shāhnāma, is the most popular and influential of the Iranian and Afghan national epics. The Shāhnāma, or the "Book of Kings," consists of the translation of an even older Pahlavi (Middle Persian) work. It has remained exceptionally popular among Persians for over a thousand years. It tells the history of old Persia before the Arab conquest of the region. This tale, all written in poetic form and in Darī Persian, starts 7,000 years ago, narrating the story of old Persian Kings and their exploits. 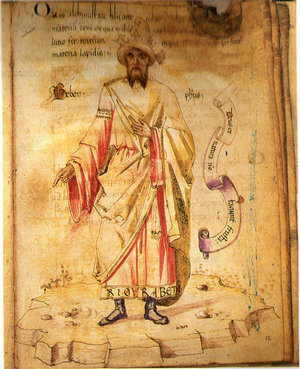 Geber (Jabir Ibn Hayyan) (c.721-815), born in Tus (Iran). Known as The Father of Chemistry, because he was the first to scientifically systemize chemistry. "The first essential in chemistry," he declared, "is that you should perform practical work and conduct experiments, for he who performs not practical work nor makes experiments will never attain the least degree of mastery." He made noteworthy advances in both the theory and practice of chemistry. His books strongly influenced European alchemists and justified their search for the philosopher's stone. He is credited with the invention of many types of now-basic chemical laboratory equipment, and with the discovery and description of many now-commonplace chemical substances and processes - such as the hydrochloric and nitric acids, distillation, and crystallization - that have become the foundation of modern chemistry and chemical engineering. He was a prominent student of Jafar Sadiq. Geber (Jabir) wrote more than one hundred treatises on various subjects, of which 22 are about alchemy. Firmly grounded on experimental observation, his books systematized the knowledge about the fundamental chemical processes of the alchemists - such as crystallization, distillation, calcination, sublimation and evaporation - thus making a great step in the evolution of chemistry from an occultist art to a scientific discipline. In particular, Jabir emphasized that definite quantities of various substances are involved in a chemical reaction, thus anticipating by almost a thousand years the principles of quantitative chemistry and the law of definite proportions. Hafez� (1310-1389) was a Persian mystic and poet, born in He was born sometime between the years 1310 and 1337 in Shiraz, Persia (Iran), son of a certain Baha-ud-Din. His lyrical poems, ghazals are noted for their beauty and bring to fruition the love, mysticism, and early Sufi themes that had long pervaded Persian poetry. Moreover, his poetry possessed elements of modern surrealism. Hallaj, Mansur aka Hallaj (858 - 922) was a Persian mystic, writer and teacher of Sufism. Hallaj's grandfather may have been a Zoroastrian. As a youngster he memorized the Qur'an and would often retreat from worldly pursuits to join other mystics in study. Hallaj would later marry and make a pilgrimage to Mecca. After his trip to the holy city, he traveled extensively and wrote and taught along the way. He traveled as far as India and Central Asia gaining many followers, many of whom accompanied him on his second and third trips to Mecca. After this period of travel, he settled down in the Abbasid capital of Baghdad. His writings are very important not only to Sufis, but to all Muslims. Many Thelemites also make use of his teachings, especially in terms of his identification as God - a central gnostic principle. His example is seen by some as one that should be emulated, especially his calm demeanor in the face of torture and his forgiving of his tormentors. Many honor him as an adept that came to realize the inherent divine nature of all men and women. Others continue to see him as a heretic. Harawi� (Abu Mansur Muwaffak ibn Ali) was a 10th century Persian physician. He wrote the Book of the Remedies (Kitab al-abnyia 'an Haqa'iq al-adwiya), which is the oldest prose work in modern Persian. It deals with 585 remedies (of which 466 are derived from plants, 75 from minerals, 44 from animals), classified into four groups according to their actions. Harawi distinguished between sodium carbonate and potassium carbonate, and seems to have had some knowledge about arsenious oxide, cupric oxide, silicic acid, and antimony; he knew the toxilogical effects of copper and lead compounds, the depilatory virtue of quicklime, the composition of plaster of Paris and its surgical use. Kashi (1380-1429) aka Ghiyaseddin Jamsheed Kashani was a Persian astronomer and mathematician. His name also appears as al-Kashi. He was born in Kashan, Iran. Called as the second Ptolemy by a contemporary historian of his time, Kashi's compendium of the Science of Astronomy written in 1410 - 1411. Kashi produced his treatise Risala al-Muhitiya (Treatise on the Circumference) in July 1424, a work in which he calculated 2π to nine sexagesimal (base 60) places and translated this into sixteen decimal (base 10) places. This was an achievement far beyond anything which had been obtained before by the Greeks, Chinese or Indians, let alone the Arabs. It would be almost 200 years before van Ceulen would surpass Kashi's accuracy with 20 decimal places. Born in Rayy, Iran in the year 251AH/865CE. 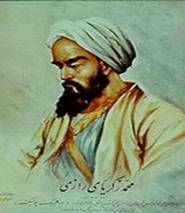 ; died in Rayy, Iran, 313/925), was a versatile Persian Philosopher (hakim), who made fundamental and lasting contributions to the fields of medicine, chemistry (alchemy) and philosophy. He is also known as Al-Razi, Ar-Razi, and Ibn Zakaria (Zakariya). Razi had no organized system of philosophy, but compared to his time he must be reckoned as the most vigorous and liberal thinker in Islam and perhaps in the whole history of human thought. He was a pure rationalist, extremely confident in the power of reason, free from every kind of prejudice, and very daring in the expression of his ideas without reserve. He believed in man, in progress, and in God the Wise, but in no religion whatever. He is credited with, among other things, the discovery of sulfuric acid, the "work horse" of modern chemistry and chemical engineering; and also of ethanol (in addition to its refinement) and its use in medicine. Razi was a prolific writer, writing 184 books and articles in several fields of science. 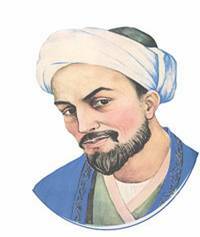 According to historian Ibn an-Nadim, Razi distinguished himself as the best physician of his time who had fully absorbed Greek medical learning. He traveled in many lands and rendered service to many princes and rulers. As a medical educator, he attracted many students of all levels. He was said to be compassionate, kind, upright, and devoted to the service of his patients, whether rich or poor. The Razi Institute near Tehran, Iran was named after him (of course around one thousand years later). Razi Day (Pharmacy Day) is commemorated in Iran every August 27 in Iran and a few other countries in its neighborhood. In Persian, Razi means "from the city of Rayy (also spelled RAY, REY, or RAI, old Persian RAGHA, Latin RHAGAE, formerly one of the great cities of World)" near south Tehran, Iran, where he was born and (like Avicenna) did much of his work. Ray was the major central city of Iran until the Mongols conquer of the 13th century, when it was gradually replaced with Tehran. "Smallpox appears when the blood boils and infected so that extra vapors may be driven out to turn childhood blood, which looks like wet extracts, into youth blood, which looks like ripe wine. Essentially, smallpox is like the bubbles found in wine at this time ... this disease might also be present apart from such times. The best thing to do at such times is to avoid it, that is, when the disease is seen to become epidemic." "Let your first thought be to strengthen the natural vitality." "Truth in medicine is an unattainable goal, and the art as described in books is far beneath the knowledge of an experienced and thoughtful physician." "How can anyone think philosophically while committed to those old wives' tales, founded on contradictions, obdurate ignorance, and dogmatism?" "Gentility of character, and nicety and purity of mind, is found in those who are capable of thinking deeply about abstruse matters and scientific minutiae." "Man should hasten to protect himself from love before succumbing and wean his soul from it if he falls." "The self-admirer, generally, should not glorify himself nor be so conceited that he elevates himself above his counterparts. Neither should he belittle himself to the extent that he becomes inferior to his counterparts or to those who are inferior both to him and to his counterparts in the sight of others. If he follows this advice, he will be free of self-admiration and feelings of inferiority, and people would call him the one who truly knows himself." Tomb of Omar Khayy�m, Neishapur, Iran. The Man known in English as the poet Omar Khayy�m (1048 -1123) was born in Nishapur in Khorasan, Persia (Iran), and named Ghiyath al-Din Abu'l-Fath Umar ibn Ibrahim Al-Nisaburi al-Khayyami (al-Khayyami means "the tentmaker"). He was famous during his lifetime as a mathematician and astronomer who calculated how to correct the Persian calendar. On March 15, 1079, Sultan Jalal al-Din Malekshah Saljuqi (1072-1092) put Omar's corrected calendar into effect, as in Europe Julius Caesar had done in 46 B.C. with the corrections of Sosigenes, and as Pope Gregory XIII would do in February 1552 with Aloysius Lilius' corrected calendar (although Britain would not switch from the Julian to the Gregorian calendar until 1751, and Russia would not switch until 1918). He is also well known for inventing the method of solving cubic equations by intersecting a parabola with a circle. In 1073, the Malik-Shah, ruler of Esfahan, invited Khayy�m to build and work with an observatory, along with various other distinguished scientists. Eventually, Khayy�m very accurately (correct to within six decimal places) measured the length of the year as 365.24219858156 days. He was famous in Persian and Arab world for his astronomical observations. He built a (now lost) map of stars in the sky. The philosophy of Omar Khayyam was quite different from official Islamic dogmas. He agreed with the existence of God but objected to the notion that every particular event and phenomenon was the result of divine intervention. Instead he supported the view that laws of nature explained all particular phenomena of observed life. Religious officials asked him many times to explain his different views about Islam. Khayyam eventually made a hajj [pilgrimage] to Mecca in order to prove he was a faithful follower of the religion. 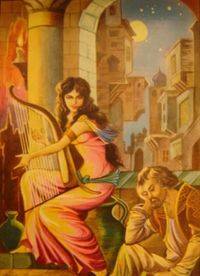 Hollywood depiction of Omar Khayyam. Omar Khayy�m is famous today not for his scientific accomplishments, but for his literary works. He is believed to have written about a thousand four-line verses. In the English-speaking world, he is best known for The Rub�iy�t of Omar Khayy�m in the English translations by Edward Fitzgerald (1809-1883). Other people have also published translations of some of the rub�iy�t (rub�iy�t means "quatrains"), but Fitzgerald's are the best known. Translations also exist in languages other than English. 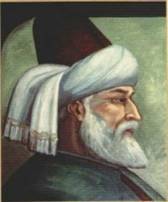 Rumi (Mawlānā Jalāl-ad-Dīn Muhammad Rūmī) (1207- 1273), was a 13th century Persian poet, jurist, and theologian. His name literally means "Majesty of Religion", Jalal means "majesty" and Din means "religion". Rumi's importance is considered to transcend national and ethnic borders. Throughout the centuries he has had a significant influence on Persian as well as Urdu and Turkish literatures. His poems, almost all written in Persian, are widely read in the Persian speaking countries of Iran, Afghanistan and Tajikistan and have been widely translated into many of the world's languages in various formats. After Rumi's death, his followers founded the Mevlevi Order, better known as the "Whirling Dervishes", who believe in performing their worship in the form of dance and music ceremony called the sema. It was his meeting with the dervish Shams Tabrizi in the late fall of 1244 that changed his life completely. Shams had traveled throughout the Middle East searching and praying for someone who could "endure my company". A voice came, "What will you give in return?" "My head!" "The one you seek is Jelaluddin of Konya." On the night of December 5, 1248, as Rumi and Shams were talking, Shams was called to the back door. He went out, never to be seen again. It is believed that he was murdered with the connivance of Rumi's son, Allaedin; if so, Shams indeed gave his head for the privilege of mystical friendship. For more than ten years after meeting Shams, Mawlana had been spontaneously composing ghazals, and these had been collected in the Divan-i Kabir. Rumi found another companion in Saladin Zarkub, the goldsmith. After Saladin's death, Rumi's scribe and favorite student Husam Chelebi assumed the role. One day, the two of them were wandering through the Meram vineyards outside of Konya when Husam described an idea he had to Rumi: "If you were to write a book like the Ilahiname of Sanai or the Mantik'ut-Tayr'i of Attar it would become the companion of many troubadours. They would fill their hearts from your work and compose music to accompany it." "When we are dead, seek not our tomb in the earth, but find it in the hearts of humanity. 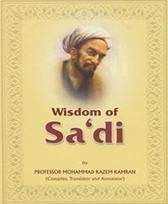 Saadi (1184 - 1283) is one of the major Persian poets of the medieval period. He is recognized not only for the quality of his writing, but also for the depth and breath of his social thought. The unsettled conditions following the Mongol invasion of Persia led him to wander abroad through Anatolia, Syria, Egypt, Mesopotamia and perhaps Spain. He also refers in his work to travels in India and Central Asia. Saadi is very much like Marco Polo who traveled in the region from 1271 to 1294. There is a difference, however, between the two. While Marco Polo gravitated to the potentates and the good life, Saadi mingled with the ordinary survivors of the Mongol holocaust. He sat in remote teahouses late into the night and exchanged views with merchants, farmers, preachers, wayfarers, thieves, and Sufi mendicants. For twenty years or more, he continued the same schedule of preaching, advising, learning, honing his sermons, and polishing them into gems illuminating the wisdom and foibles of his people. Saadi is best known works are Bostan ("The Orchard") in 1257 and Gulistan ("The Rose Garden") in 1258. Bostan is entirely in verse (epic metre) and consists of stories aptly illustrating the standard virtues recommended to Muslims (justice, liberality, modesty, contentment) as well as of reflections on the behavior of dervishes and their ecstatic practices. Golestan is mainly in prose and contains stories and personal anecdotes. The text is interspersed with a variety of short poems, containing aphorisms, advice, and humorous reflections. Saadi demonstrates a profound awareness of the absurdity of human existence. The fate of those who depend on the changeable moods of kings is contrasted with the freedom of the dervishes. 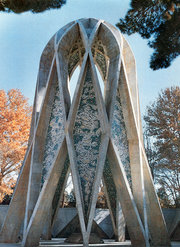 For Western students, Bostan and Golestan have a special attraction; but Saadi is also remembered as a great panegyricist and lyricist, the author of a number of masterly general odes portraying human experience, and also of particular odes such as the lament on the fall of Baghdad after the Mongol invasion in 1258. His lyrics are to be found in Ghazaliyat ("Lyrics") and his odes in Qasa'id ("Odes"). He is also known for a number of works in Arabic. The peculiar blend of human kindness and cynicism, humor, and resignation displayed in Saadi's works, together with a tendency to avoid the hard dilemma, make him, to many, the most typical and lovable writer in the world of Iranian culture. Shams� (1248-????) 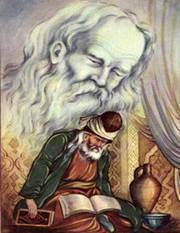 was an Iranian Sufi mystic born in the city of Tabriz in Iranian Azerbaijan. He is responsible for initiating Mawlānā Jalāl ad-Dīn Muhammad Rūmī, usually known as Rumi in the West, into Islamic mysticism, and is immortalized by Rumi's poetry collection Diwan-e Shams-e Tabriz-i ("The Works of Shams of Tabriz"). Shams lived together with Rumi in Konya, in present-day Turkey, for several years, and is also known to have traveled to Damascus in present-day Syria. After several years with Rumi, Shams vanished from the pages of history quite suddenly. It is not known what became of him after his departure from Rumi, and there are several locations that lay claim to his gravesite. As the years passed, Rumi attributed more and more of his own poetry to Shams as a sign of love for his departed friend and master. Indeed, it quickly becomes clear in reading Rumi that Shams was elevated to a symbol of God's love for humankind, and that Shams was a sun ("Shams" is Arabic for "sun") shining the Light of God on Rumi. 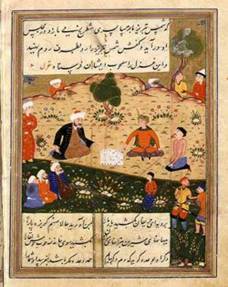 Shams Tabrizi in a circa 1503 copy of his disciple Rumi's poem, the "Diwan-e Shams-e Tabriz-i"
Tusi (Nasir al-Din Muhammad ibn Muhammad ibn Hasan al-Tusi) was a 13th century Persian of the Shi'a Twelver Islamic belief, born in Tus, Khorasan, Iran. He is known as a philosopher, mathematician, astronomer, theologian, physician, and a prolific writer, i.e., he was a polymath. K. N. Toosi University of Technology in Iran is named after him. Nasir al-Din Tusi was born in Tus in the year 1201 and began his studies at an early age. In Tus he studied Arabic, the Qur'an, Hadith, Shi'a jurisprudence, logic, philosophy, mathematics, medicine and astronomy. At a young age he moved to Nishapur to study philosophy under Farid al-Din Damad and mathematics under Muhammad Hasib. As the armies of Genghis Khan swept his homeland, he fled to join the Ismailis and made his most important contributions in science during this time when he was moving from one stronghold to another. He finally joined Hulagu Khan's ranks, after the invasion of the Alamut castle by the Hashshashin Mongol forces. Tusi made very accurate tables of planetary movements as depicted in his book Zij-i ilkhani (the Ilkhanic Tables). This book contains astronomical tables for calculating the positions of the planets and the names of the stars. His model for the planetary system is believed to be the most advanced of his time, and was used extensively until the development of the heliocentric model in the time of Copernicus. Between Ptolemy and Copernicus, he is considered by many to be one of the most eminent astronomers of his time. He was perhaps the first to treat trigonometry as a separate mathematical discipline, and in his Treatise on the Quadrilateral he was the first to list the six distinct cases of a right triangle in spherical trigonometry. For his planetary models, he invented a geometrical technique called a Tusi-couple, which generates linear motion from the sum of two circular motions. He also calculated the value for the annual precession of the equinoxes and contributed to the construction and usage of some astronomical instruments including the astrolabe. He gave the first extensive exposition of spherical trigonometry. A 60-km diameter lunar crater located on the southern hemisphere of the moon is named after him as "Nasireddin". He also wrote extensively on biology and is one of the early pioneers of a kind of evolutionism in scientific thought.